Tiny Tots is a 45-minute parent participation class for children ages 12 months to 17-months-old in our Little Gym. Tuition for Tiny Tots is $90 per child. 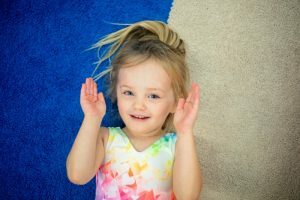 Tiny Tots is designed to help your child’s coordination, body awareness and jump-start the beginning of their motor skills. We will utilize the Big Gym floor to explore movement through music by using instruments, gymnastics mats, parachutes, swings and various stretching exercises. Tiny Tots is not offered during the summer session. This class will re-open in August for the 2019-2020 school year sessions.